Many MANY thanks to Denise Atwood for commissioning several "blank check" episodes of Spoil Me! and letting me choose what I wanted to read! 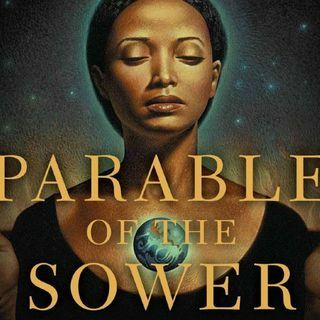 I'm using two episodes on Parable Of The Sower, and I am still deciding what I'm going to use the third one for so I will keep you all posted. This was a truly heart wrenching read, in many ways because this whole disaster was sort of inevitable. It's just a little too close to our experience today, with people in deep denial ... See More about the direction our country is going and the potential for where it will end up. If people had been more willing to hear the upsetting but ultimately helpful truth, maybe they could have been more prepared. Even if they didn't save the community, perhaps they could have ended up alive. But in some ways, I think Lauren is better off without Cory in her life, as much as I regret the loss of her remaining brothers. And now she has a couple of new friends, who seem as practical and clear-headed as she does, so we shall see where they all end up.